At the beginning of the year, members purchase a share of the crop. Then throughout the season, you receive your share of the harvest. Shareholders do not know what they are getting in advance, but they know it will be nutritious seasonal local bounty. You and your family can be more involved in the farming process, enjoy fresh picked vegetables throughout the season and help us preserve open land in the area. Veronica's Garden 2019 season will run from June 29 (weather permitting) to October 19, a total of 17 weeks. Shares for the season are $575 for FULL SHARE and $325 for HALF SHARE. 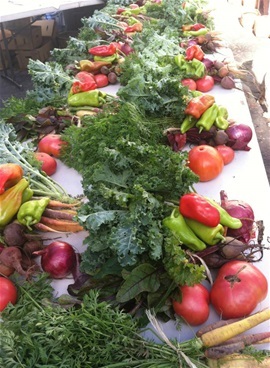 Members will pick up their share from our Ridgefield farm stand location. Shares usually include 7-10 types of vegetables and/or fruit. Full shares are enough for a family of 3-5 people and half shares for a family of 2-4. Learn how to use these vegetables through our recipes posted weekly on our website. If you haven't already and would like to join our waitlist, please go to the tab - How do I Join. We will try to add you as a shareholder as soon as possible. Current CSA members are given first preference (until Jan 1) and then we open to our waiting list in date stamped order. We will contact everyone after signup is complete to advise of status. If the need arises where you can not pickup your share (vacation, work schedule, sickness) please let us know by Thursday of that week that someone else will be picking up your share and their name. We are always happy to have the bounty shared with others! Shares not picked up at the set time, without prior notification, will be donated and you will forfeit that week. If for any reason you cannot return the box provided from the previous week, please plan on bringing something else to take your share home in. The shares are non-refundable; some years you get more than you expected, but there is always a chance you might get less some seasons. In essence, the idea is that the community makes a commitment to the farm and the farmer to stick it out through thick and thin.